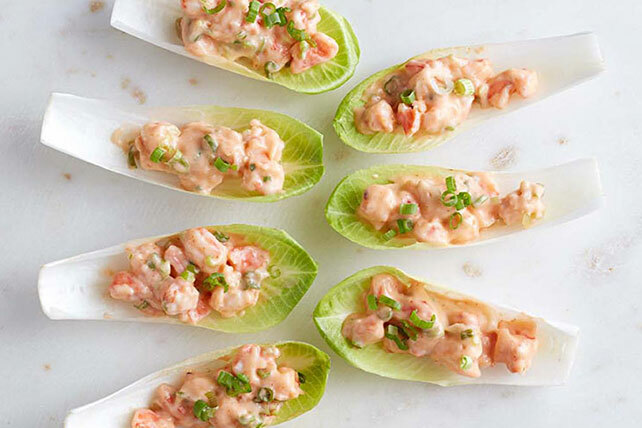 Win over the spicy Sriracha shrimp fans at your next party with elegant Sriracha Shrimp-Endive Appetizers topped with Sriracha-spiked awesomeness. Reserve 1 Tbsp. green onion tops for later use. Combine remaining onions with shrimp, dressing and Sriracha sauce. Belgian endive, a member of the chicory family, has a slightly bitter flavor and long cigar-shaped head with compact creamy colored pale leaves with yellow-green tips. The whiter the leaves, the less bitter the taste.